On the heels of opening a $97-million plant in China’s Shandong Province Tuesday, and announcing that “China, for us, represents the future, a new world to explore,” Italian tiremaker Pirelli released the 35th edition of its exclusive calendar, “Pearls of the Orient” (sounds of gagging), shot entirely in Shanghai. Coinky-dink? Prolly not. 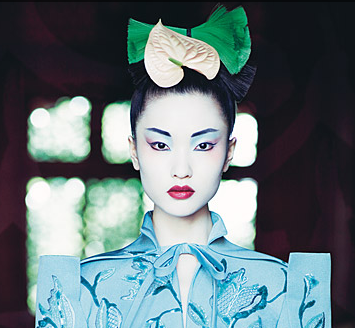 It’s the first calendar of its kind shot in Asia by Patrick Demarchelier and features ubimodels Gemma Ward and Agyness Deyn in racial drag, Chinese models Du Juan and Mo Wandan–also, I suppose, in drag–and one of my favorite actresses, Maggie Cheung. All of them are wearing Dior Hot Cooter.